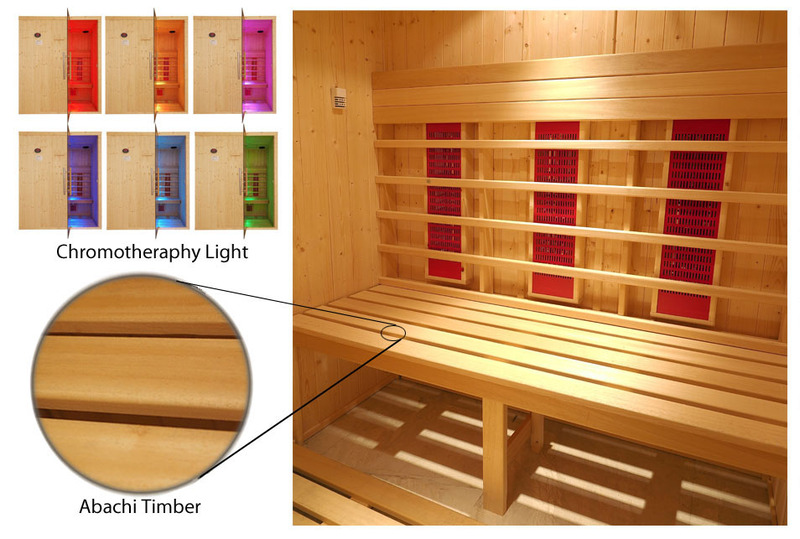 The Oceanic IR2525LC 1650 x 1650 x H1950mm (2400Watts) infrared sauna is supplied complete with 8 x 300 watt Oceanic infrared heaters with digital controls having a countdown timer for settings up to 60 minutes, a thermostatic temperature control to set upto 60°C and a high temperature safety cut off at 80°C to prevent overheating. Stereo Speakers with bluetooth or audio connection lead to connect to compatible MP3 or smart phone devices, our brand new modern full height safety glass sauna door with clear glass, polished chrome & Ash wood handle and polished chrome hinges. 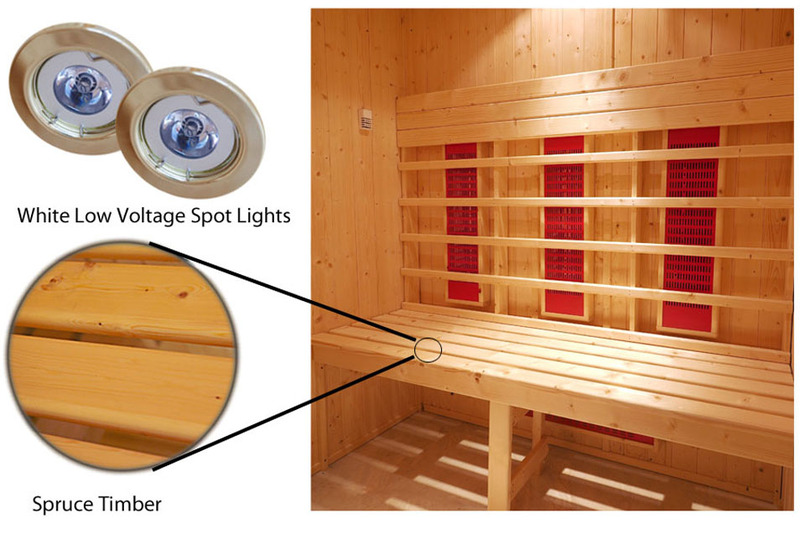 Slatted wooden benches, backrest and, floor mat (deluxe model only), lighting, all fittings and fixing, assembly manuals and user instructions. The Infrared Saunarium system has been designed with simplicity in mind no plumbing or drainage is required – the generator is topped up with water from a jug or a kettle. Just a small amount of water produces a considerable amount of steam – during a 10 to 15 minute session only a cup full is boiled away – and thanks to the special coating and extra ventilation at the end of the steaming session any small amount of condensate left inside the cabin can easily be sponged away, then the door and vents left open for it to dry. All infrared saunarium panels are clad on both sides with spruce cladding, are coated on interior faces with Saunarium water barrier treatment, and are fully insulated with rock wool fibre to reduce heat loss, increase efficiency, reduce warm up time and improve user comfort. Please note the Infrared Saunarium system is only available on specified models.